Enzyme-linked Immunosorbent Assay (ELISA) is a technique designed to quantify peptides, proteins, antibodies and hormones in a wide variety of matrices. 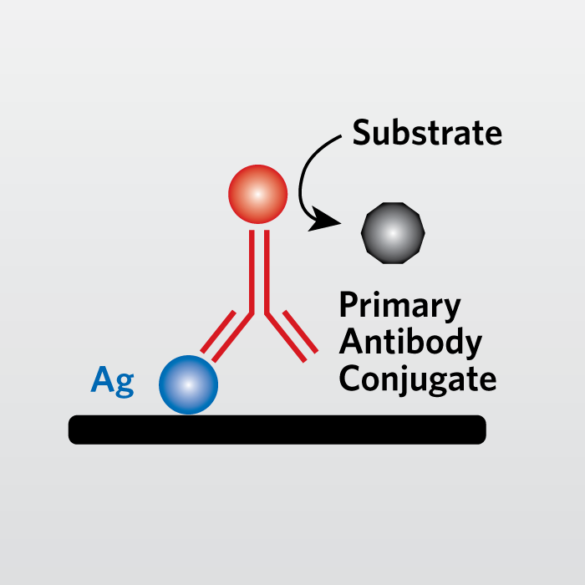 In this process, a specific antibody first detects the analyte. Typically a second antibody is used to bind to the analyte-specific antibody which is then conjugated to an enzyme, such as horseradish peroxidase. After washing to remove all antibodies that are not bound to the analyte, a substrate is added. The enzyme converts the substrate to a product that is usually visible by a color change. At a specific time point, the conversion of the substrate is stopped and the absorbance of each sample at the specified wavelength is then determined and compared to a standard curve to determine the concentration of analyte in each sample. This assay is plate based so multiple samples can be analyzed at the same time. The assay can be adapted for multiple matrices or multiple analytes within the same matrix. Other signals (fluorescence, phosphorescence. electrochemical luminescence) may also be used to improve matrix interferences or to improve background noise. Additionally, kinetic, endpoint, spectrum, or well scan reads can be analyzed. EAG scientists have experience developing and optimizing ELISA assays. At each step, EAG scientists work in close collaboration with the customer, offering suggestions for the next experiments. Once developed, the methods are validated to demonstrate that the assay is robust, accurate, and precise.